Description: Children can "sail" up and down pretend rivers, navigate through narrow channels, ride the waves of the open seas. They can catch fish and throw them back or store them beneath the deck. The take apart boat has a screwdriver "smokestack". 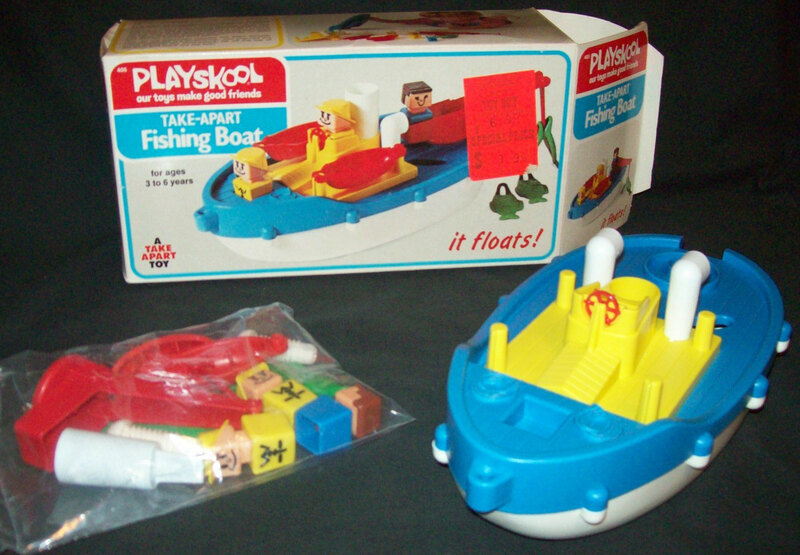 Children can unscrew the two screws and take off the fishing crane, the pilot house that covers the engine, or the entire deck. 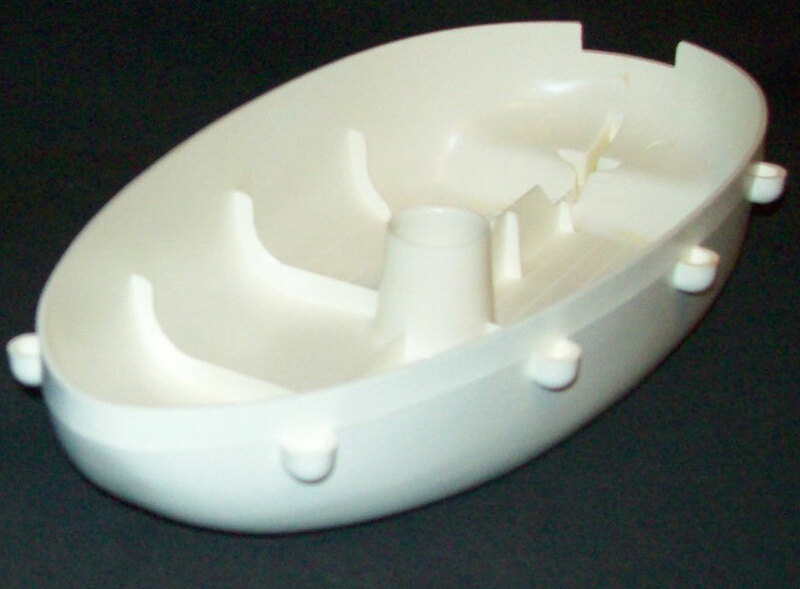 Hull - PSK160 - White plastic boat hull (base) with a molded motor/propeller on the back, 10 rounded bumper knobs on the outside edges, and a large upright peg in the center (to attach other boat pieces). 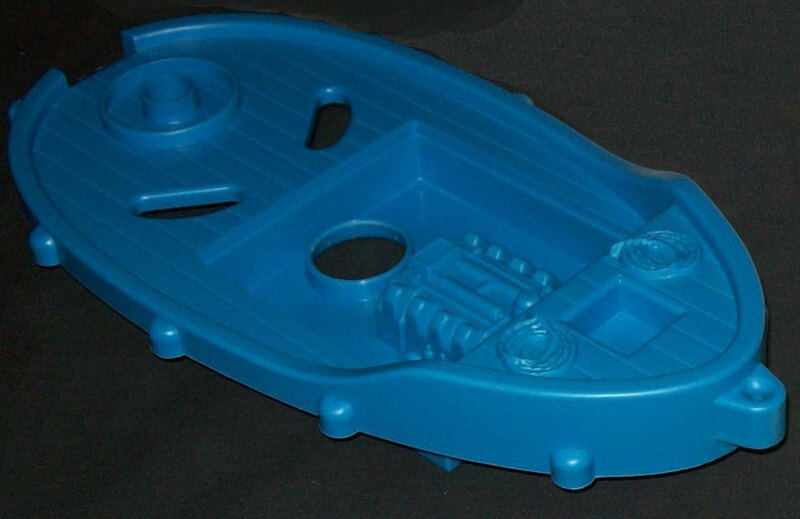 Deck - PSK161 - Blue oval-shaped boat deck with a simulated wood plank deck floor, 10 rounded bumper knobs on the outside edges, and a square recessed area in the center with a molded engine and a large round hole (to attach other boat pieces). The front deck is slightly raised, has 1 square "seat" (for figures to fit into) and a molded pile of rope on each side of the "seat". The back of the deck has 2 oval holes and 2 raised circles (tall small circle within large short circle) to attach fishing crane. Pilot House - PSK162 - Square yellow pilot house with a simulated wood plank deck floor, 4 upright posts (one on each corner), 2 upright white smoke stacks (curved at top), and a raised captain's deck in the center. The captain's deck has a large hole (to attach other boat pieces), and 1 square seat with a red movable captain's wheel. Fishing Crane - PSK163 - Red L-shaped crane with a round base on bottom, and an attached dangling red hook on the top. Smoke Stack - PSK164 - Large round white smoke stack with a screw head on one end (doubles as a screw driver). Screw - 2 each - PSK165 - Large white plastic screw with a rounded screw head (flat-head driver slit in center of screw head). Dinghie (boat) - 2 each - PSK166 - Small red dinghie boat with a round peg on each end. Each end peg has a raised peg in the center (to attach other boat pieces). Fish - 6 each - PSK167 - Flat green plastic fish with molded "scales" on the sides and a large loop on the mouth end (to fit onto fishing crane hook). 2 each - PSK168 - Yellow body, yellow hat, chest design: V-Collar, Tie w/ 2 tie clips. PSK5 - Blue base, brown hair, chest design: Triangle Collar, Polka-dot Tie.